Scientists continue to confirm, there’s more to nutrition than just the classic vitamins and minerals. As important as these nutrients are to optimal health, we’re also learning that phytonutrients, enzymes, trace minerals and others play equally important roles. Original Formula IV, developed in the 1950’s, was the first multifactor food supplement to provide vitamins, minerals, enzymes and phytonutrients, such as important lipids and sterols. Formula IV Plus carries forward this tradition of nutritional excellence with an Iron Free formulation that also provides additional mineral support. Formula IV Plus also provides more Tre-en-en Grain Concentrates, which have provided people throughout the world with decades of nutritional assurance at the cellular level. The human body requires a wide variety of nutrients to be its healthy best. Many diets do not provide the density or diversity of nutrients needed to assure optimal health. Many modern diets rely on processed staple foods which have been stripped of nutrients important for cell function, especially lipids and sterols. Other “modern” foods lack important trace minerals due to over- processing. 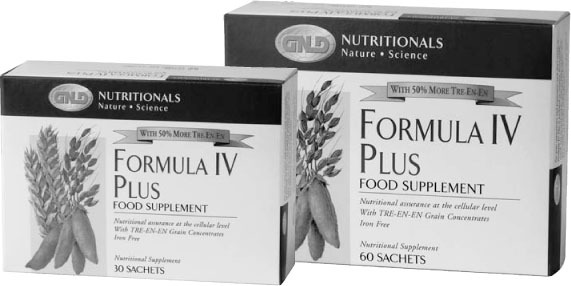 Why GNLD’s formula IV plus? Delivers a wide array of vitamins plus important minerals. Contains Tre-en-en Grain Concentrates from wheat germ, rice bran and soyabeans, all rich sources of essential lipids and sterols important for cellular health. Lipids and sterols provide critical support for the healthy cellular uptake of nutrients and cellular export of waste and metabolites. Strengthens the function of all “links” in the “Chain of Life”, by providing lipids and sterols, vitamins, minerals and enzymes, as well as by providing key nutrients for the body’s digestion, synthesis and utilisation of protein and the body’s utilisation of carbohydrates for energy. Tre-en-en works in syergy with the vitamins, minerals and other nutrients in the product and has been scientifically proven to support efficient utilisation of nutrients. Available in individual sachets for take-anywhere convenience. Tre-en-en Grain Concentrates: 675 mg of lipid and sterol extracts from wheat germ, rice bran and soyabeans. Replaces trace minerals food processing strips away: Selenium, chromium and molybdenum. Broad-spectrum supplementation: Key vitamins, minerals, enzymes and lipids/sterols all working together to bridge dietary gaps. Convenient: Each serving is safely sealed in a transparent sachet that you can take with you anywhere.